Conclusion: THE book on Swiss 109s. The history of the Bf-109 is fairly well known but did you know that the earliest 109s flew in Switzerland before the war and continued to fly until after the war was over. Not all 109s are the same. Swiss 109s were different than their German counterparts in both armament, fuselage and cockpit components. This hardbound book consists 255 pages and includes nearly 450 photos, including a color section. Many of the photos are previously unpublished photos even in the German edition of this book. There are numerous color profiles as well. The earliest 109s flown in Switzerland were used during the Air Races in Zurich in 1938. These included the wine red Bf-109V-14 flown by Ernst Udet. There are a lot of clear photos of the aircraft from the race and not just the Me-109. This particular section is a real boon for air racer enthusiast. The evaluation process the Swiss used to choose the 109 is described in detail. The weapons and the decision to use a Swiss made MG instead of the German equivalent are studied. The evolution of the forward cowling which is different between the countries is described including some great detail photos, ideal for model builders. The guns weren’t the only difference on Swiss aircraft. One of the more notable ones is the spade type KG 11 control stick. The radio equipment is also different and shown to great advantage. Even the paint of the Swiss aircraft was different than their German counterparts, with the Swiss using 70/65 instead of the three tone scheme worn by the Germans. Signal rockets were added to the fuselage as well as a new prop. Weapons development including a wing bomb rack are shown. The Swiss versions of the bomb racks offer a unique look at early 109s. You thought that the Me-109T was the only 109 with arresting gear. Like me, you would be incorrect. The Swiss also tested and installed hooks on their aircraft in the post war period. The quality of the photos throughout the book is just phenomenal. I can’t say enough good things about the photos. Clear, large and perfectly suitable for modelers and historians. The color photos are nice some of them have color shifted but they offer great insight to the aircraft along with some beautiful backgrounds. One unique piece of history is that the Swiss Me-109’s first kills were over German aircraft, namely He-111s. The first engagement on 10 May 1940 resulted in one He-111 being downed. 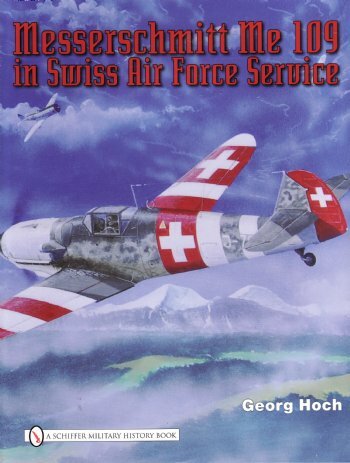 The book follows the Swiss Air Force through out the war which evolves into a highly trained and efficient fighting force. They also did not differentiate between Germans and Allies shooting down each when they violated the neutral airspace. The Swiss 109s also sported some of the coolest paint schemes the 109 every had, including shark mouths. Garish shark mouths are not common but the “ugliest” 109 is a Swiss 109G which has a shark mouth covering the entire nose. Red and white markings were added and add some dramatic color to a drab machine after some aircraft were shot down by USAAF fighters. The appendices include original extracts from the Ersatzteilliste (parts manual) that are unique to the Swiss aircraft. These extracts are very clear and actually quite useable for the model builder. A listing is provided that follows ever 109 that the Swiss had to include the fuselage number, werk nummer, as well as, other pertinent information to the disposition of the airframe. The writing in this book is easy to read and understand. It does not get boring and bogged down, not even in the technical section on the guns and radios. You will notice that there are plenty of photos of aircraft with broken landing gear which is natural to a 109 and the Swiss were no different. Most of the aircraft are the Emil variant as the Gustav was not introduced until mid 1944. In my opinion, this book is THE book on Swiss 109s. It is the only English source, that I’m aware of, for this significant 109 operator. I’ve have the German version of this book but Schiffer has updated this with more and better quality photos. Of course it is nice to be able to finally read it too. Thanks to Aeroplane Books for the review copy. You can obtain your copy by contacting them through their website at http://www.aeroplanebooks.com/ . Make sure you tell them you heard about it here.